Letter to Jane may be seen as a companion piece to the intriguing Tout Va Bien (1972), for the idea of the film sprouted during the making of Tout Va Bien. Godard and fellow Dziga Vertov Group filmmaker Gorin share the sound-space as they step out of the cinematic medium and go on to discuss the role of filmmakers in political activism. Through pictures of Vietnam war, they talk about the importance of questions and questions of importance. They urge the audience to take a journey rather than watch the film and hence decide the role of filmmakers as a whole. 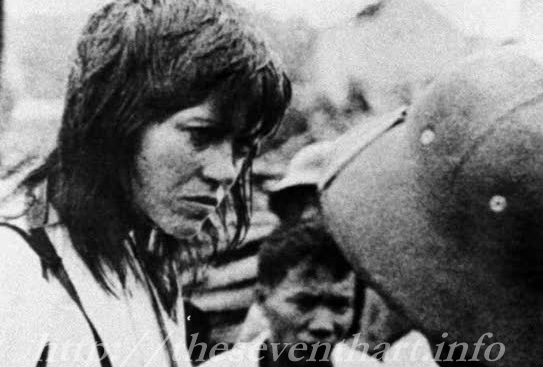 Through one particular picture, that of Jane Fonda “empathizing” with the guerrillas, Godard brings forth issues of media initiated lionization, attitude of the west towards the Vietnam crisis and the Kuleshov effect on photos from the war. Letter to Jane is the most and perhaps the only disappointing Godard film I’ve seen. Disappointing because Godard not only explores the role of intellectuals in revolution and politics but also tries desperately to classify himself as one. Disappointing because what he did absolutely effortlessly in his early films, he tries to do it as a requirement. Godard dismissed his early films as being bourgeoisie, but even Letter to Jane seems like a discourse for high-brow cocktail sipping crowd, contradicting Godard’s Dziga Vertov principles. Is it only me who feels that Godard is playing God and trying hard to over-analyze what may be a genuine gesture for concern or am I succumbing to the Kuleshov effect too? May be not. Godard himself seems to have become disillusioned after the film, once again, and reworked his strategies and policies. Having said that, Letter to Jane is one of the most engaging Godard films of this period. With a single gesture from a photograph, Godard extracts so much meaning out of Fonda’s glance (the comparison spectrum runs from Descartes to Welles) that any actor watching the film will feel a shiver running down the spine. They’ll know they are being watched and they’ll know acting isn’t a walk in the park. And true to the film’s claims, it does not give us answers and neither does it tell what the questions are. What is sure is that it asks the audience to extract the questions themselves, for right answers follow only right questions. Another new one. On Amazon. Vietnam War. Grueling and too real. Exciting and written well. Lots of stuff hard to take because I don’t wanna be there. It’s written by Ron Lealos and titled Don’t Mean Nuthin’.